New Year’s Celebrations have always struck me as odd. The sentiment is great: To begin anew at living a more purposeful life! But why make January 1 out to be a special day unlike any other? With God, every single morning that he gives us breath becomes an opportunity for new layers of purposeful living! Nevertheless, looking ahead at a year of programming—the favorite rituals and the exciting possibilities—there are a number of ways that I as a leader and our ministry team altogether hope to evolve and grow! Communication: It’s funny that in our hyper-connected world, communication is more hollow than ever. This year, a primary goal is to change communication from leadership talking atyou to leadership talking with you in two-way conversation. Connection: Our ministry is not about games and lessons, but human connection. Parents—you have a story; your teens do too; as do I; and we are all part of God’s story. This year, I want to create opportunities for us all to share our stories. Leadership:Every conversation I have with anyone at Good Shepherd blows me away as I hear about the gifts and passions God has planted in everyone’s heart. This year, I want parents, students, and leaders to know that their passions and gifts are welcomed in leadership at COGS! Note: At this time, we are censoring any content regarding healthy sexuality to respect parents' wishes. We will address healthy romance and godly sexuality in a series all its own in the near future. We will partner closely with parents so we can all help our teenagers grow in their understanding of godliness and purity together. High School students have the opportunity to serve on Saturday, January 5, anytime between 8:30 and 11:30 am. We will be painting several rooms around the church, and can use as many hands as possible! Students do not need to stay for the entire time; you are welcome to come and go as you need! Enjoy some of our favorite games together as we consider what makes our group unique and awesome! We will also return to our youth series, “Better Than One,” examining friendship with Dhati Lewis in a lesson titled, Choose Wisely. Dr. Christa Johnson, a Christian psychologist from Psychological Health Affiliates, will present on the topic of Intentional Parenting, offering guiding principles as well as specific strategies for raising your children of all ages! 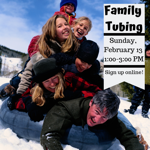 Snow Tubing has been rescheduled for Sunday, January 13, 1:00-3:00 PM. Join us for an afternoon of family fun and get to know others in our church family! Faith, Friendship, Food! These three pillars help make COGS Youth Night a place for unique connection. Join us for a night meant to nurture deep friendship and faith through different activities and a lesson. This week, we will wrap up our "Better Than One" series with Dhati Lewis by taking a look at a lesson titled, Be A Good Friend. Faith, Friendship, Food! These three pillars help make COGS Youth Night a place for unique connection. Join us for a night meant to nurture deep friendship and faith through different activities and a lesson. This week, we will immerse ourselves in the story of the Good Samaritan, reflecting on who exactly God has called us to love. Nothing says fun like an afternoon with friends and family at the Mt. Gretna Roller Rink! Laugh, Fall, Dance, and Race your way around the people you love most! After hearing from many friends serving in youth ministry about the Zeteo Retreat, we are trying something new for our Winter Retreat this year! Zeteo is a Greek word meaning, "To seek in order to find," and this special retreat is intentionally designed to help students seek God more honestly through worship, story, teaching, and small group time. Be sure to join us for this awesome faith opportunity that is sure to leave us with plenty of fun memories as well! DUE TO TICKET SHORTAGE, AVAILABLE SLOTS HAVE DROPPED TO 12!